This is a traditional thangka with the central figure being Milarepa with ChakraSamvara in te sky above and disciples flanking him. This thangka is quite large, about 6 ft tall and was done with traditioanal dot shading. It took amny months to paint the sky and shade the thangka. This thangka is not my drawing but was given to me by my teacher who recieved it from his teacher. 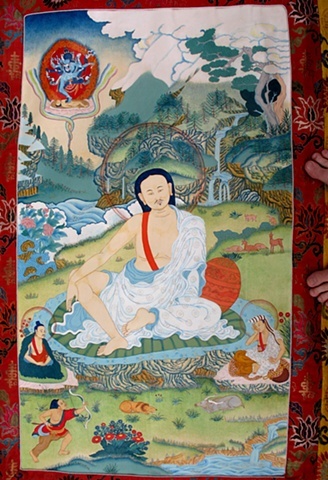 This is in keeping with Thangka painting tradition - to share one's drawings and thigses. I honor this tradition and carry it forward.